If you haven’t heard of DLM Dashboard, let me fill you in – it’s a new free tool for helping SQL Server DBAs and developers know what database schema is deployed where. One of the main ways DLM Dashboard does this is by sending an email notification as soon as it spots any unexpected schema changes. DLM Dashboard’s email notifications have proved hugely popular. Over the last 6 months we’ve had heaps of feedback from users telling us how they’ve avoided problems by being notified of unexpected schema changes. But what if you don’t live in your email inbox? Something that most users don’t know is that receiving notifications in your inbox is just the start of what you can do with DLM Dashboard. In fact, the possibilities are practically limitless. You can use DLM Dashboard’s email notifications to automate a vast array of tasks, like alerting you and your team via HipChat, or automatically creating a new issue on GitHub when an unplanned schema change is made. All you need to do is configure DLM Dashboard’s email notifications to be sent to a web integration service such as Zapier or IFFFT. Once connected, you can configure the email notifications to trigger automated tasks with a huge number of services and apps. When a schema change is made to a database that DLM Dashboard is watching, an alert is triggered. DLM Dashboard then sends an email notification to your chosen web integration service. The web integration service receives the notification email and, depending on the contents of the email, triggers an automated task within your chosen app or service. Don’t worry if you’ve already set up email notifications to be sent to your email address; DLM Dashboard allows you to send notifications to multiple email addresses. Most web integration services allow you to configure email addresses which in turn trigger an action. So what exactly can I do? All you need to do is set up email notifications in DLM Dashboard and configure them to be sent to Zapier or IFTTT. You can then create an automated task which is triggered whenever an email is sent. I’d definitely recommend spending some time experimenting with all of the various integrations and services – as I said before, the possibilities are limitless! If you’d like more detailed instructions, why not read my follow-up article? It includes an in-depth explanation of how to send Slack IM alerts to you and your team whenever your database schemas change. In the meantime – have fun experimenting! 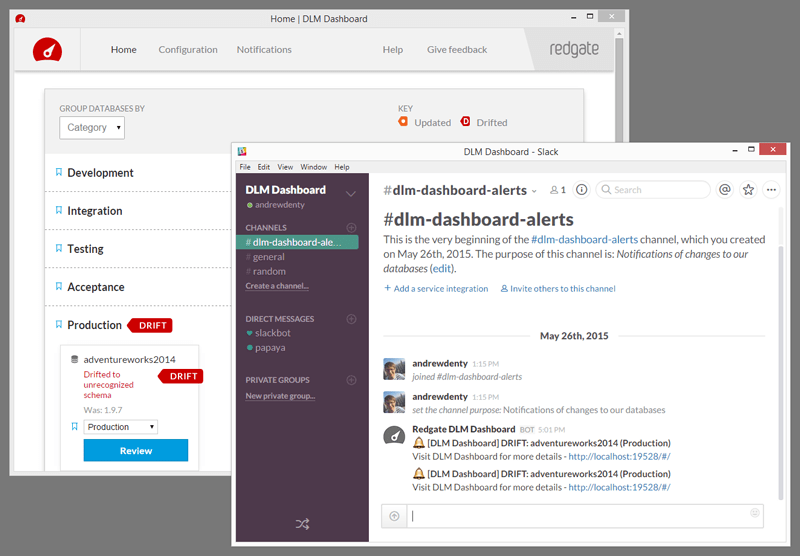 DLM Dashboard is Redgate’s new free tool for helping DBAs and developers know what database schema is deployed where. If you want to find out more, download the free edition! Track your SQL Server databases and be the first to know about schema changes.